Chef Johnny Ray Zone doing his thing at Howlin' Ray's. For two weeks straight in 2014, Johnny Ray Zone replaced the usual cream in his coffee with a heaping capful of Pepto-Bismol. “After a while you start to appreciate the licorice and anise notes,” he says. 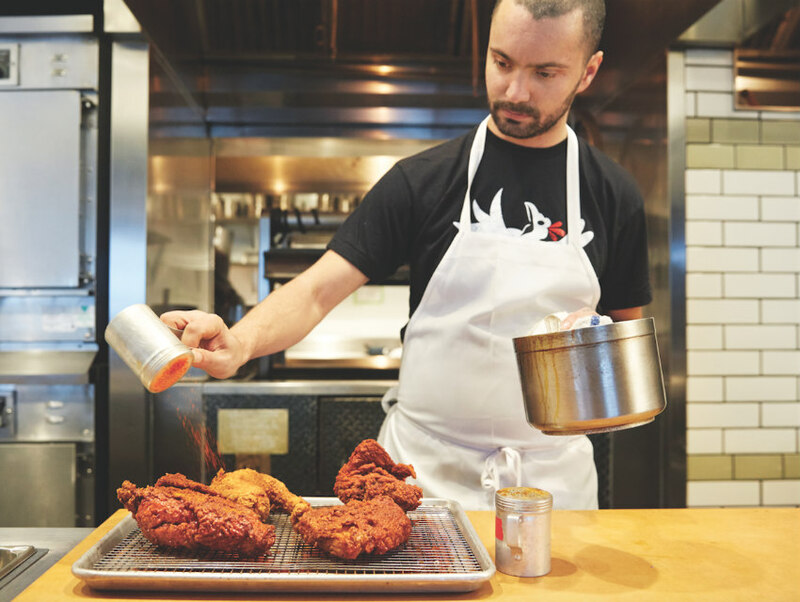 Zone, the 28-year-old former executive chef at Hollywood’s La Poubelle, was traveling through Tennessee with his wife, Amanda, to research a regional specialty: Nashville hot chicken. The burn from the Music City’s version of fried poultry is deeper than that of your typical buffalo wing. The oil or lard used to turn cayenne, paprika, and other spices into a dark red lacquer intensifies the heat (capsaicin is fat soluble), resulting in a crunchy delight as delicious as it is agonizing. “I wanted to become an expert on this dish,” says Zone, who grew up in Silver Lake. “I wanted to live it and breathe it.” The result of his stomach-busting dedication was the food truck Howlin’ Ray’s. Launched last summer, it served Nashville hot chicken quarters alongside a short list of classic Southern sides like pimento cheese mac salad—pasta salad’s Bible Belt cousin—and braised collard greens. Within six months he had a fanatic following and more than one investment offer. Zone declined, using his own money to sign a lease for Howlin’ Ray’s restaurant, which is set to open Chinatown. Since the truck was a rental, Zone will be turning in the keys once he gets the new place off the ground. His next-door neighbor? Chego, a reincarnation of Kogi truck founder Roy Choi’s first permanent restaurant. Choi’s boundary-pushing amalgam had the benefit of being out in front and having honest roots. There’s a different reason for Howlin’ Ray’s success: a respect for why traditional recipes are so beloved in the first place.